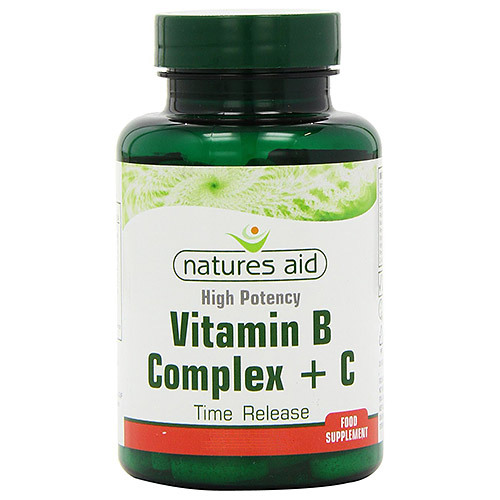 Natures Aid High Potency Vitamin B Complex + Vitamin C contains different B vitamins including, thiamin (vitamin B1), riboflavin (vitamin B2), Niacin (Vitamin B3), vitamin B6 and vitamin B12. This formulation also provides high amounts of vitamin C.
Vitamin C Prep (Ascorbic Acid, hypromellose), Microcrystalline Cellulose, hypromellose, Thiamin (as Hydrochloride), Vitamin B6 (as Pyridoxine Hydrochloride), Pantothenic Acid (as Calcium Pantothenate), Riboflavin, Niacin (as Nicotinamide), Inositol, Choline Bitartrate, Para Amino Benzoic Acid (P.A.B.A), Anticaking Agents, (Vegetable Source Stearic Acid, Silicon Dioxide, Vegetable Source, Magnesium Stearate), Vitamin B12 Prep (Cyanocobalamin, Calcium Phosphate) Folic Acid, D-Biotin. This product is free from artificial Flavours, colours & preservatives, lactose, yeast and gluten. Take 1- 2 tablets per day with food or as recommended by a healthcare professional. Food supplements should not be used as a substitute for a varied diet. Keep out of reach and sight of children. Store in a cool dry place. Long term intakes of 50mg of vitamin B6 per day may lead to mild tingling and numbness. 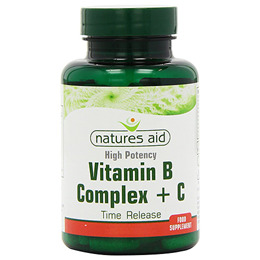 Below are reviews of Natures Aid Vitamin B Complex + Vitamin C - 30 Tablets by bodykind customers. If you have tried this product we'd love to hear what you think so please leave a review. I have only been taking these vitamin tablets for a week or so, but I do feel that they are helping me in connection with health problems.